Staff from The Co-operative Financial Services (CFS) dug-deep for the community, when it teamed up with Food4Macc yesterday (Thursday, 12 May) to develop fruit and flower gardens at The Rowans Care Home, Macclesfield. As part of The Co-operative Volunteer Programme, ten colleagues from the member-owned financial services provider – which has branches of Britannia and The Co-operative Bank in the town – took part in the team challenge to build two new ground level growing-beds for fruit bushes and flowering shrubs. 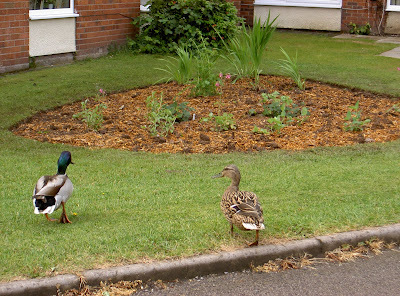 In addition to preparing the ground for currants, goji berries and honeyberries, members of the team also watered, weeded and pruned existing planted areas at the care home. Working with local voluntary group, Food4Macc – which aims to encourage more food to be produced locally as part of a move towards a more sustainable community - the new garden areas will now be used by the residents and their families to sit in and, to enjoy picking the fruit and vegetable when it is ready to eat. 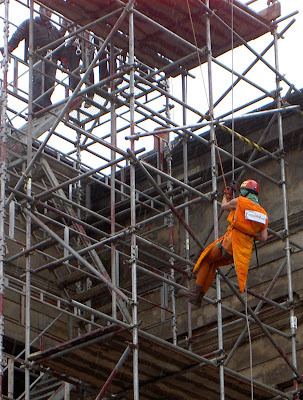 Please note, following Britannia’s merger with The Co-operative Financial Services (CFS) in 2009, it became inaccurate to refer to Britannia as a ‘Building Society’. For further help or information, please contact Andrew Torr in The Co-operative Group Press Office on 0161 827 5622. Food4Macc is a voluntary group that aims to have more food produced locally in the Macclesfield area as part of a planned transition from today's oil dependency, to a low-carbon sustainable community. 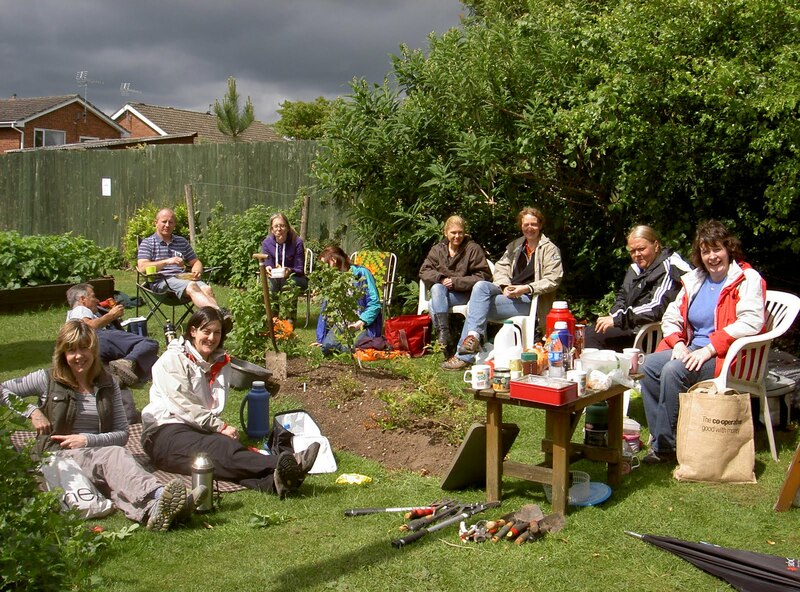 Its main areas of activity are: Talks and Demonstrations every month with its Gardening Club. Sharing experience, swapping seeds, plants and produce. Six Community gardens where you can grow fruit and vegetables, and learn from more experienced gardeners. A Garden Share scheme that matches gardeners with disused vegetable plots. Helping local farmers market their produce in the local community with food maps and, encouraging others to plan ahead for life when oil prices and food are more expensive than today. 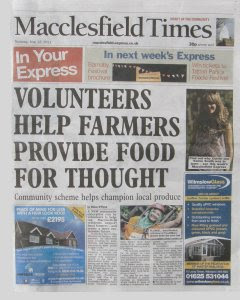 Following their success in the Barnaby parade last year the Food4Macc carrots have been resting. 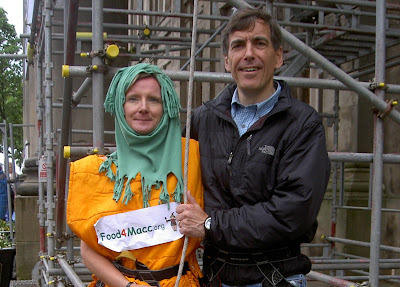 However the opportunity to abseil down the front of the Macclesfield town hall with local MP David Rutley on Saturday, was too much to resist. Sara Wreford donned the costume and braved strong winds and rain to show how it is done. 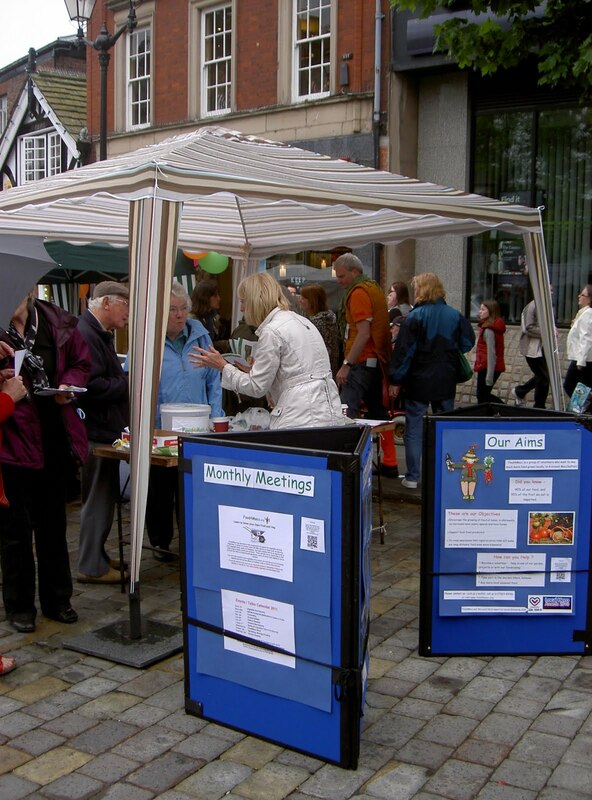 The event was to launch the new Macclesfield Brand Image and there were several stalls in the market place, a climbing wall and entertainment. 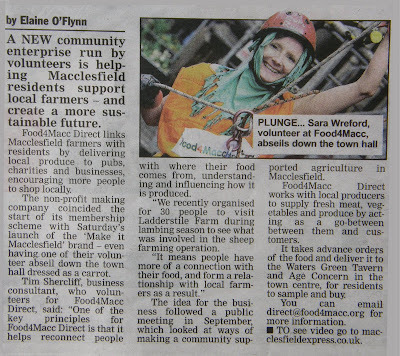 The Food4Macc stall created a lot of interest in local food, giving away free seeds and offering tastings of locally produced bread.